a strong open and distance education system in India. Padma Shri Fr. Thomas V. Kunnunkal SJ, born in July 3, 1926, is a well known Jesuit missionary, social and human rights activist and eminent educationist, is one of the pioneers who built the foundations for a strong open and distance education system in India. He was a Research Director at the Indian Social Institute, New Delhi, where Father Kunnunkal steered actions leading to education, socio-economic development and promotion of human rights among marginalised groups of Indian society. Father Kunnunkal was born in a rural family in Kerala. After completing his university education in India and the United States, he assumed the responsibilities of a Jesuit missionary. He got involved in school education and, while heading St. Xavier's School, a prestigious school in Delhi, he was awarded Padma Shree by the Government of India for his contributions in education. It was during his second stint as Principal that Father Kunnunkal conceived and developed his thinking about relevance and flexibility in schooling as a necessary requirement to facilitate access to education for rural and marginalised communities. The Government of India, realising the need to revitalise the secondary schooling system and considering the meritorious service to school education and his excellent administrative capabilities and leadership qualities, appointed Father Kunnunkal as the Chairman of the Central Board of Secondary Education (CBSE) under the Union Government. Father Kunnunkal thus got the opportunity to nurture and strengthen the Open School project, which was being implemented as part of the CBSE, the first open learning programme in India. During his tenure as Chairman of the CBSE, Father Kunnunkal developed a Project Proposal for the National Open School for consideration by the Ministry of Human Resource Development, Government of India. This led to the establishment of the National Open School (later renamed the National Institute of Open Schooling) in 1989. Father Kunnunkal's vision of linking learning with livelihoods found concrete application in the flexible curriculum of academic and vocational courses offered by the NOS. Father Kunnunkal was Chairman until 1993 and during this time he developed and nurtured a flexible, innovative and workable system of open schooling. It allowed any learner, regardless of his/her age, location or educational qualifications, to enroll and study using self-learning study materials, to obtain tutorial support in accredited study centres and to get certification recognised for further education and employment. “Mr. President, for pioneering the idea and creating a model of open schooling in India which has literally shaken the rigid and conventional schooling system in the country by making school education more accessible, relevant and affordable to the socially and economically marginalised communities, as well as for influencing the establishment of such systems elsewhere in the Commonwealth, I request you to confer on Reverend Father Thomas V. Kunnunkal SJ, the award of Honorary Fellow of the Commonwealth of Learning”. Fr. Tom is still contributing to the educational system of India. He is the mentor and guide of JEA too. Fr Elias D'Souza is no more! A saintly Jesuit, a luminary in academic pursuits, an amazingly able administrator, a man with a sharp mind and a golden heart, is gone from our midst. The clear voice that spoke fearlessly on behalf of the poor and the marginalized, and with tenderness to those who were suffering and afflicted, is now silent; the feet that trod on the rugged paths in and around Arsikere bringing solace and strength, comfort and encouragement to hundreds of Sisters and thousands of people now lie cold and stiff in death; he who was like a Guardian Angel to many a Parish Priest in the district will never be seen or heard again. Soon he may be forgotten too! But the dent he has made in the lives of thousands of people will continue to bear eloquent witness to the goodness, generosity, self-sacrificing spirit, kind-heartedness, spiritual influence and emotional intelligence of this man of God, and to be a source of edification to his fellow Jesuits and a host of friends and admirers. Early Life: Even as a young school boy Elias impressed as intellectually bright, sociable, kind and service-minded. In his later life he recorded steady growth of these and many other sterling qualities to a superlative degree. One of the proofs of his brilliance is the I Rank he scored in the Maths Honours Exam of the Madras University. As a Jesuit, he was known for his holiness of life and dedication to duty. Regularity at prayer and study, simplicity of life style, accountability, thorough knowledge of the Constitutions of the Society, extraordinary clarity and facility in classroom teaching, care and concern for others, and total commitment to day-to-day work - these and many other endowments characterised his life as a Jesuit. He was elected as a delegate of the Karnataka Province to the Procurator's Congregation in Rome in 1970. The report he submitted in his official capacity to Fr General was considered to be absolutely objective as well as flawless in content and form. At the Get-together of the senior Jesuits of Karnataka held in May this year, Fr Elias was called upon to give the key-note address. Choosing Modernity as the topic, he dwelt on the significant developments and changes that have put many aspects of Church law, liturgy, Theology, Apostolate, life style etc. in a new perspective. He explained clearly that the senior Jesuits can and ought to be aware of them and accept them in order to update themselves and be relevant in their ministry and to close the generation gap between them and the younger Jesuits. His absorbing talk which was interspersed with humorous anecdotes inspired and encouraged all to get into a fruitful reflection and sharing of experiences in a lively session which had a very positive direction. Educator and Administrator: Fr Elias's outstanding qualities of head and heart had full play during his tenure as Principal of St Joseph's College, Bangalore and Warden and teacher at St Aloysius College, Mangalore for a number of years. Soft-spoken and exceptionally quiet, he was nevertheless a giant of an administrator. Unassuming, polite, smiling, very capable, devoted, diplomatic - one can go on adding adjectives of superlative excellence, when one thinks of him as a Principal. Staff and students alike approached him as they would a father figure with as much confidence and trust as reverential awe. "We worshipped him", said a retired old staff member in a spontaneous outburst at the sight of his body in the coffin. Fr Elias could assess the quality and work of the staff members quite accurately. He had a photographic memory. he took personal interest in and had intimate knowledge of practically every student in the college though it had a strength of than 2000. He introduced `on-the-spot admission' to applicants with very high marks thereby attracting and rewarding bright students. His concern for economically poor students was well known. He introduced a system to enable these students to pay their tuition fees in easy, monthly instalments. While he was extremely kind at heart, he was at the same time a good disciplinarian and had an uncanny eye for detail in every department of college administration. As the warden of the hostel, he would personally take care of the sick inmates, would visit them daily when they were hospitalized and ensure that they got proper medical care and good food. Ministry after Retirement: On reaching the age of superannuation in the educational apostolate, he took up the healing ministry among the sick, offering them solace and comfort. For three years, he worked with utmost dedication at the St John's Medical College Hospital, Bangalore. He was then posted to Arsikere, where he exercised his pastoral zeal in an exemplary way. Here he was actively involved in a variety of spiritual service at several convents, schools, parishes and other institutions for 20 long years till his last illness and death. Frail in body, but endowed with an iron will he carried out this ministry entrusted to him by his Superiors, with genuine zeal, travelling always by bus and braving all kinds of inconveniences and hardships caused by his illness and the nature of his work. Fr Elias had excellent rapport with people of other faiths too. He frequently visited and interacted with the Swamijis of various Mutts existing in the region of his apostolate. These contacts had brought about a harmonious relationship among peoples of different faiths. His Last Days: Only a few of his friends know that he suffered from continual headaches almost throughout his life. For many years he was the victim of low blood sugar and its consequenc es. He accepted it all as a matter of course. His last illness was triggered off by a heart attack he suffered in early July 1999. This meant a big trial to himself, a great shock to the Sisters and fellow Jesuits, and a tremendous blow to his ministry. Weak and worn out, he suffered for a month from acute headaches and restlessness of body and mind. Because of his pathological condition he experienced increasingly severe and frequent bouts of pain and helpless ness. By degrees he grew weaker and weaker and was finally left with no stamina to face the ordeal. He got a massive attack,and he breathed his last at about 8.30 a.m.
"Restless for Christ" is the title of a book that Fr James Coelho wrote, and that title in a way sums up his whole life. Small in stature but great in his mind and heart and tirelessly seeking what more he could do for Christ, Fr James lived a full life, and went back to his Creator on 22.01.2000 after taking ill and being hospitalized just for one day. Born in Mangalore on 22.08.1913, he did his school and college education in St Aloysius College, Mangalore, and joined the Jesuit Order at the age of 20. After 15 years of training he was ordained a priest. Fr James lived the life of a Jesuit priest ideally. His Superiors assigned him to the field of education where he held many important offices with distinction. He was the Principal of St Aloysius High School Mangalore from 1955 to 1957. His work in Bangalore comprised a series of offices: Minister of St Joseph's College, 1957-58, Principal of St Joseph's Indian High School while being the Rector of St Joseph's College from 1957-63. He is best known by a large number of students of St Joseph's Indian High School for his kindness, affability and interest in all while maintaining excellent discipline. At that time the St Joseph's Boys High School held the pride of place whereas the Indian School was like the poor cousin without proper playgrounds and other facilities.Thanks to Fr James the Middle School Section of the IHS was shifted to the New Fields in a new building constructed for this purpose, and subsequently the whole school wasshifted to the New Fields. The M.G. Road grounds were transferred to the StJoseph's Boys High School. On his retirement from teaching at the statutory age of 55, Fr James was appointed Director of Gonzaga House, Mangalore, the house of candidates from 1965-68. He was then appointed Manager of the St Aloysius College Middle School from 1968-73 where he was in the midst of the little children. He was then made the Director of Fatima Retreat House from 1973-81 during which time he added two new blocks for the accommodation of the retreatants and halls for dining, meetings and prayer. Fr James was specially beloved by the children of the Middle School. Large numbers of them would visit him every morning before class for his blessing, a kind word, a pat on the head. Old age did not prevent him from his spiritual ministry in the neighbourhood and in the religious houses around, specially to minister to the sick in the nearby hospital and in the families closeby. His chief characteristic was availability, so much so, we could have truly said: `Fr. James, availability is your name'! Simplicity is your hallmark!! 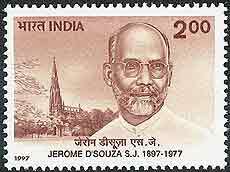 Fr.Jerome D'Souza, SJ was an Indian Jesuit priest, educationist, writer and member of the Indian Constituent assembly (1946–50). Born in the Moolki town of Mangalore in the erstwile South Canara district of British India, to a Catholic family cultivating intellectual interest, Jerome was soon at home in several local languages. He did his secondary schooling at St. Aloysius College (Mangalore) and college studies in St. Joseph's College (Tiruchirapalli, Tamil Nadu, India). Completing finally the English Literature course at the University of Madras (Chennai) he first taught a year at St Joseph's College, Trichy, before deciding to enter the Society of Jesus (29 May 1921). He then went through the usual Jesuit training, doing his theological studies with the French Jesuits in Belgium at the end of which he was ordained priest on the 30 August 1931 (Enghien, Belgium). He hailed from the Mangalorean Catholic community. Back in India in 1933, he was appointed professor in his alma mater, the St Joseph’s College of Trichy of which he became within a few years, rector and president. An able administrator, Jerome was also a convincing orator. He soon attracted the attention of Sir C. Rajagopalachari (known as Rajaji), the then president of the Indian National Congress. Transferred in 1942 to the Loyola College of Chennai (formerly Madras), to be his rector, D’Souza soon became involved in the legal establishment of the University of Madras (Chennai). When the time came to form an assembly that would draw a constitution for the country—the independence of India was near—D’Souza’s name was proposed by Rajagopalachari to the Madras legislative assembly. He was elected to represent them at the constituent assembly of Delhi. At the assembly (1946 to 1950), along with the Protestant leader H.C. Mukherjee, D’Souza ensured the rights of the minorities (especially of worship and education) were fully protected by the proposed text and the right to practice and propagate one’s religion were included in the constitution as fundamental rights of all citizens of India. He negotiated with the Vatican the termination of the Portuguese Padroado system that was giving to Portugal an undue say in the appointment of bishops in India. He was involved in the negotiations with the French government leading ultimately to a peaceful transfer of the French colonial settlements (Chandannagar, Pondicherry, etc.) to the new Independent India. On four occasions D’Souza was member of the Indian delegation to the UNO’s yearly general session. His command of French, Spanish, Italian and German languages, besides English opened him many doors and he was often invited to give talks and lectures on Indian culture, history and politics, in various parts of the world. At the request of the Superior General of the Society of Jesus, D’Souza founded in Pune (India) the Indian Social Institute (now in New-Delhi, 10, Institutional Area, Lodhi Road New Delhi), and started published a journal Social Action that has nowadays a large circulation in social and academic circles. That was in 1947. Later, in 1957, D’Souza was made the Assistant and adviser of the Superior General of the Jesuits (Jean-Baptiste Janssens) for Indian and Asian affairs. He returned to India in 1968 and spent his last years writing articles and books, giving lectures and courses. Jerome D’Souza was one of the best known Jesuit of his times. The book written by Fr. Hess SJ, charts the journey of a boy born in 1919 in New Jersey to a devout Catholic family. His father's business of manufacturing bulbs failed and they moved to Washington DC, which was the turning point for young George. Being intelligent, he won a scholarship in 1933 to Gonzaga College, a Jesuit school, and three years later, at the age of 13, was convinced that he wanted to become a Catholic priest. He came to India in 1952 at the age of 32 at a time when India had just become independent. His first assignment was to set up Loyola School in Jamshedpur, which he took up in 1952 with 285 students. Loyola was given 3.5 acres that once housed the Chhotanagpur Regimental Club (CNR). Hindi classes were held in a small school bus while the CNR Club hall housed several classes at the same time. Under Fr Francis MacFarland's supervision, construction of the new building began and by the time Fr Hess left in 1963, it housed 1,500 students. Today, Loyola School, Jamshedpur, accommodates over 3,000 students. Father Hess was the principal of De Nobili School from 1963 to 1979. After leaving De Nobili School, Father Hess spent 17 years as the principal of Loyola College of Education in Jamshedpur from 1979 to 1996. The author has taken pains to describe his method of running a school, planning new projects and dealing with difficult students and staff. He has also been quite candid about his conflict of interest with his superiors and about how he had to adjust to the need of his province. He developed De Nobili School, Dhanbad, which was just a small family house on the grounds of the Central Fuel Research Institute with five rooms, to another institution that rivalled Loyola School in the number of students, building and grounds. He stayed on for 17 years and developed long-standing relationships in that city. Fr. Hess passed away on 30 July 2013 at the age of 94. R.I.P. Rev. Fr Walleghem Gerard Van SJ passed away this morning around 07.45 . Many of you might know Fr Van. He has served the Darjeeling Jesuit Province under various capacities: as Rector of North Point, Headmaster of St Alphonsus School, Kurseong, P.C.F. and Novice Master of Darjeeling Jesuit Province. He has also served as student counselor and Coordinator for Jesuit Alumni Association. May the good Lord grant him eternal rest. Born as the 7th son of Mr. Jules and Mrs. Eliza Van Walleghem, Fr. Van was born in 1927 into a Belgian family in Winnipeg, Canada. “Right from his earliest childhood he was different than other kids, in that he was always more kind, more compassionate, deeply religious and more considerate than others” – informed Mrs.Yvonne Van Walleghem, his Sister-in-Law when we contacted her for comments on Fr. Van. He graduated from St. Paul’s school Winnipeg, Canada in 1944 and decided to join the Society of Jesus (SJ) and become a Jesuits Priest. Following the completion of his early trainings and a BA degree from the University of Montreal, Fr. Van decided to dedicate his life to helping the disadvantaged, and to this end, he volunteered for service here in Darjeeling. He arrived in India in January, of 1952 and has lived in Darjeeling most of his adult life. Father Van has worked as a teacher, counselor, headmaster, vice-rector, and rector at St. Joseph’s College in North Point (both School and College) Darjeeling. In addition to his work at St. Joseph’s, Fr. Van has also been the Head Master of St. Alphonsus High School in Kurseong. During the 1968 landslide which had devastated pretty much all of Darjeeling. Fr. Van along with Late. Fr. Edward Burns worked tirelessly towards providing relief and rehabilitation to those who had lost their everything in the massive landslide that year. Later their efforts resulted in the formation of one of Darjeeling’s most iconic social-work organization – the Hayden Hall. When war broke out between India and Pakistan in 1971 (war for the Bangladesh Independence), Fr. Van again tirelessly led the relief efforts in the refugee camps established for Bangladeshi refugees in the foot hills of Darjeeling. During the 1986-1989 Gorkhaland Andolan ,Fr. Van again provided help, counseling, relief and assisted in provisioning rehabilitation to thousands of our brothers and sisters who suffered during the period. In 2006 Fr. Van finally started to realize his long cherished dream of starting St. Joseph’s School at Mungpoo. It was his dream to provide quality affordable education to the children in rural Darjeeling, and when he was in a position to start a school, he decided to use a very old and traditional building material – Bamboo. What sets Mungpoo St. Joseph’s is that the students are not just taught regular school subjects, but they are also imparted vocational education – Students are taught beekeeping, bioorganic farming, planting mushrooms and many more vocations. For the past few years Fr. Van has been giving spiritual and psychological support to patients and their families in Planters hospital, and despite his failing health, he has continued to serve Darjeeling and its people. Fr. Van has lived a very simple and content life and is perhaps one of the very few individuals who at the age of 87 years only has ONE REGRET – that is not being an Indian citizen. It is not that he had not tried to apply for Indian citizenship, but every time he applied, his application has been rejected. It is a shame that despite his unmatched love for India and its people, the Government of India has repeatedly let down Fr. Van by denying him citizenship. Fr. Van recalls that he must have applied to be an Indian citizen almost 10 times, but shockingly enough every time he applied, he was declined by the same individual – some Mr. Chatterjee. In 1989 when the then Prime Minister Rajiv Gandhi had visited Darjeeling, Fr. Van was amongst a group of Jesuits priests who were invited to meet the Hon’able PM and when the PM asked what could he do for the Jesuits? they had responded – we want to be Indians. The PM assured the priests that he will personally look into the matter and requested the Jesuits to send in their applications. Fr. Van did… and guess what? After about four months he received a letter saying his application for Indian Citizenship has been rejected – once again the letter was signed by some Mr. Chatterjee. But not being granted the Indian citizenship has never deterred Fr. Van and his love for Darjeeling and its people has only increased with the passing days. Today he is revered by the people in Darjeeling, and his students who are spread worldwide cherish his presence in their life. In 2002 the University of Manitoba awarded upon Fr. Gerard A. Van Walleghem, the degree of Doctor of Laws (LLD) honoris causa. In 2009, the St. Joseph’s Alumni Association felicitated the long, wonderful and dedicated services of both Fr. Van and Fr. Burns. He is a true blue Darjeeling Icon!! and we wish and hope and pray for his long and healthy life. Fr. Anthony Gatt, S.J. lovingly addressed as Ninu, was born at Zebugg, Malta on 20th January 1939. At the age of 21, on 10th October 1960 he joined the Society of Jesus. He left Malta for India on 27th July 1963 to dedicate himself for the development of student community of Jesuit schools as well as to preach Christ and his Gospel to all. He was ordained a Priest on 19th March, 1972. He studied Hindi in Ranchi. He did his philosophical studies at De Nobili College, Pune and theological studies at St. Mary’s college, Kurseong, Darjeeling while preparing himself to become a Jesuit priest. He served in various capacities, namely, Prefect of St. Joseph’s School, as Principal of St. Xavier’s School, Sahibganj and finally before retiring he was the Superior of St. Xavier’s School Raiganj. He died in the morning of 21st March 2017 at his beloved place, St. Xavier’s, Sahibganj. There are a lot of untold stories of his service which spanned from 1963 to the day he breathed his last. He had his ups and downs. As a human being he had his physical suffering from various ailments, but he was a born fighter and a crusader of justice, education and service to humanity. Like all Maltese, he was a lover of sports. He was a great footballer. People from far off villages surrounding Sahibganj used to come and watch him as well as Fr. George Camilleri play football in our School ground/ Talkies field/Railways Institute ground. His dribbling with the football was endlessly confusing the opponent players before his scoring of goals. St. Xavier’s, in 1967-1970 period were the champions in football in Sahibganj and Dumka. Fr. Ninu was a dynamic and loving person with an indefatigable spirit. He dedicated all his life to the service of the society. He lived and died happily. There was no mark of pain or anxiety to be seen on his face till his end. He prayed to die on the Indian soil and be buried beside some of his Maltese brethren at the Dumka Jesuits’ cemetery. We could fulfil his everlasting wish.